1.) Be pregnant with your VERY FIRST child OR in the process of adopting/fostering your first child OR your first child is under age 1. 2.) Be pre-registered! >>>>>Sign up here >>>> & choose the Tulsa sale...then check the box for First Time Moms. You will be emailed your sign up confirmation that will be your ticket into the sale! Note: Insert your due date or the date that your child was born in the Referred By section of the online signup form. We will have your name at the door after you pre-register. 3.) Bring 2 guests with you (husband, mother-in-law, new grandparent etc). JBF Tulsa is second hand help for first time parents! Maternity extras, bras, belts, nursing cover ups, nursing blankets, baby carriers, etc. Breast Pumps, Bottles, Bibs, Diaper Bags, Crib Bedding, Blankets, Cloth Diapers, and much more! Our families bring everything you will need to raise a child from birth and beyond! Connect with us 3 FB ways! 1) New~ CONSIGNOR Facebook Group. Join here, JBF Tulsa Consignors-get in on selling tips and all your questions answered quickly about consigning, selling, pricing. You must be signed up to consign each sale to remain in the group! This group can help you get your things ready. You can also join our contests and get special offers! 2) Like Us on our Facebook Fan page here: We try to keep everyone in the loop with emails and newsletters about JBF Tulsa and the next sales event at Expo Square, but for a more timely way of communicating with so many friends and family, JBF Tulsa relys heavily on FaceBook. For all the latest details and up-to-the-minute news! 3) Click GOING/INTERESTED by going here on our FB Event for each event! So don't be left out. Join now! NOTE: Strollers, wagons, & children 0-12 yrs. are NOT allowed at presales. We make an allowance for nursing infants (0-6 mos) who can not be away from mom, but no car seat carriers or strollers are allowed in, ~ baby wearing is allowed. Shopping Hint: Some savvy shoppers bring a measuring tape to size up clothing and make sure their items will fit when they get them home. You can also trace your child's foot outline to measure for shoes at the sale. Please report any suspicious behavior at our event to JBF staff or our police officer on duty. We hire Tulsa County Sherriffs and we have an undercover officer along with three paid EXPO trained secuity guards. Thanks to the watchful eyes of our Consignors, shoppers & volunteers we were able to keep our sale safe. We know that most people are honest and this is not common at a JBF sale, but if you see anyone switching tags, shoplifting or anything else that looks “shady” please let us know. This is your merchandise, your money. We do everything we can to prevent theft, but our eyes can’t be everywhere at once, so we appreciate your help in protecting the JBF items that you worked so hard to prepare. Think twice…”JBF Crime Stoppers” are on patrol. Do not leave any valuable in your car. We have made the decision to allow a short time slot for those consignors who NEED to bring their children to the presale. Children can shop with their parents (who have the appropriate presale pass) at 5:00 pm on Presale Day. Children must stay with their parent at all times. First Time Moms will shop at 6:00 pm. -Get 1 new mom to sign up to consign at least 30 items and refer you by name during sign up in the Referred By box + email us to let us know who you are referring or ask them to turn in your referral card, you will receive an extra 10% on your items. -Get 2 new mommies to sign up and consign at least 30 items and refer you by name during sign up in the comments box + email us or ask them to turn in your referral card, you will receive an extra 15% on your items. Help us get the word out as your friends become new moms! Get your JBF Referral Cards to print off! Click Here to download and print off Tulsa Mini Posters to hang at your place of business, gym, church, favorite resturant, or preschool. The poster lets moms snap a pic to get in free to the event! Due to our limitations on space and volunteers, we are not able to provide dressing rooms at our sales event. We strive to offer the best shopping environment as possible so you have the best selection. This also allows us to curb losses from theft, which means you can be sure your items stay safe and sell for the highest possible price! Thank you for your cooperation and understanding. Daven and I are so appreciative of everyone who helps make JBF Tulsa such a success/shining light in our community. We know you have a choice, THANKS for choosing JBF TULSA. See ya at the Sale, Mr. JBF. Send us your thoughts or ideas! 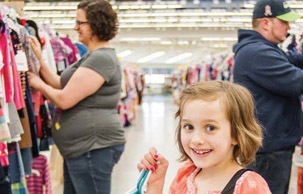 We wanted to help families save money while taking care of their family, so we started JBF! In Sept. of 1997 in a living room we started with 17 of our friends and it has grown to be the nation's largest sales event! 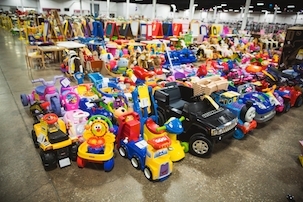 We now have more than a 1000 consignors/families who benefit from selling their gently-used items. If you would have asked me how big this business could get back in 1997, my wildest dreams would not have been this. God has truly blessed this business and many others along the way. Your items have more value at JBF Tulsa! Get involved today! Want to reach thousands of families in a week? If you own a business or have a service that families will love, let's partner! <<<Get a Vendor Application Here>>>. Contact Paul with any questions at 918-814-9326.